This is Holly. With dad's permission I'm posting a call for information. One of my classmates from Bryn Mawr has gone missing in New York City. Hannah Emily Upp, a Bryn Mawr College graduate in 2007 and a current teacher of Spanish at Thurgood Marshall Academy in Harlem has gone missing in New York City. 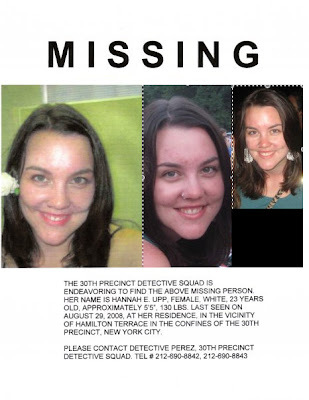 If anyone knows anything about where she is, please let Detective Perez at the 30th Precinct in New York City know. His number is (212) 690-8842. The last time anyone saw her was around 2pm on the afternoon of Friday, August 29th. According to her roommates she had been planning to go away for the weekend but intended to return on Saturday, perhaps Sunday at the latest. When they had neither seen nor heard from Hannah on Sunday afternoon, they began calling her but each time it went straight to voicemail. By Monday evening they were getting frantic and so they went into her room, where they discovered her keys, her phone, and her handbag containing her wallet. Her ATM card, her subway card, and her ID (right now just her passport) were all in there. When she didn't show up for work on Tuesday (her first day of teaching), and it became apparent that she had not gone on Friday either, the police decided it was time to file a Missing Persons Report. Everyone is desperately hoping that Hannah just got overwhelmed and took a few days off to escape, but the fact that all her stuff was found in the apartment is a mystery. If you have any information, again, please call the Detective. Fingers crossed Hannah's ok- but please do keep your eyes out.